Back in the early part of summer, I made a wisecrack while talking to Deji about her illustrator work. Moogs: Maybe I’ll hire you to do a short yuri visual novel with me. Moogs: Oh! And we can do all the art in traditional watercolor! Deji: Hey remember that watercolor VN you wanted to do? Lets do it. Moogs: Okay, so I think that’s about it for defining the project scope. And so the project that would become The Parasol Festival was born. 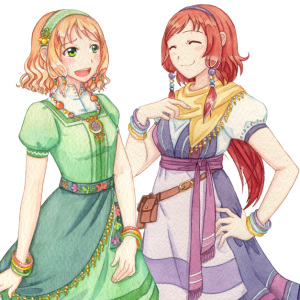 The Parasol Festival is the light hearted tale of Anise Quintilli, an apprentice merchant who falls in love with her childhood friend Lynae. As they came of age, the older Lynae left to become a traveling merchant, leaving behind Anise who was never able to convey her feelings. Now Lynae has returned for The Parasol Festival, and Anise has three days with her, three long days that will determine both of their futures. 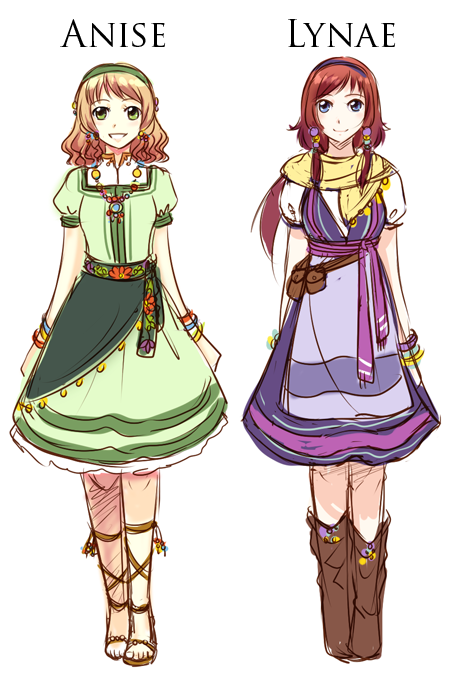 Well you are our guests, so here are the final character designs for Anise and Lynae. I wanted them to be pretty, but I pretty much fangirl over these two. Or perhaps that’s just some kind of parental instinct? If you follow Deji’s blog, you know that she’s already been working on the art for this visual novel. I got the second to last sprite turned in today, after that it’s all backgrounds and events. Here are Anise and Lynae as they will exist in the game, watercolored. I was really worried how they’d turn out, but Deji’s powers are vast and everything worked out in the end. Last but definitely not least, I have an excerpt about The Parasol Festival itself for you. I hope you enjoy it. Long before the eclectic regions that form our country joined together, they all shared a story. The Legend of the Waiting Maiden, the reason we celebrate love with The Parasol Festival. The details have been lost to time and myth, but this is what most people agree on. A young woman confessed her love to her friend and mentor. Seeing his shocked expression and unable to bear the weight of his silence, she told him to meet her the next day if he accepted her feelings. What neither of them knew was that he was fated to die the very next day. It was a pleasant spring day, flowers bloomed everywhere along the road near the spot the young woman chose to wait. She wore her finest dress, it was a bit heavy for the weather so she brought a parasol to shade herself with. There on a little hill by the road, she laid out a picnic and waited for her beloved to arrive. She passed the time by talking with travelers and merchants on the road, they were curious as to why a pretty young lady was waiting so patiently by the road. She waited through morning. Hearing her story the travelers gave her smiles and cheers. When they left, they took with them hope for a bright future. She waited through midday. Recounting her tale to new strangers, they gave her admiration, and friendly suggestions of how to punish her love for being late. When they left, they took with them renewed strength to carry on. She waited through evening. Hearing her plight, strangers gave her their best consolation, but she refused their suggestions to give up. When they finally left, they took with them a tiny hope that love would not go unrequited. After all others had come and gone, the young man finally arrived, staggering slowly down the road. Many people that day were touched by the young woman’s story, and it is said that their silent wishes for her to be happy created a miracle that saved the young man’s life. His body was battered and weary from many trials and close calls, but he was whole and had made it to her side. When the couple left the hill that night, they carried each other, and left only their story. The Parasol Festival is based on the Legend of the Waiting Maiden. Women ask those they love to meet them at the festival, and come wearing their best dresses and carrying parasols. In a country created from many smaller territories, The Parasol Festival is considered a holiday that brings people together for something universal. Perhaps the best thing that can be said about the festival is that people still believe in it.